Sites along the Forest Trails Loop offer a scenic milieu of great convenience to visitors staying in the Staunton area. 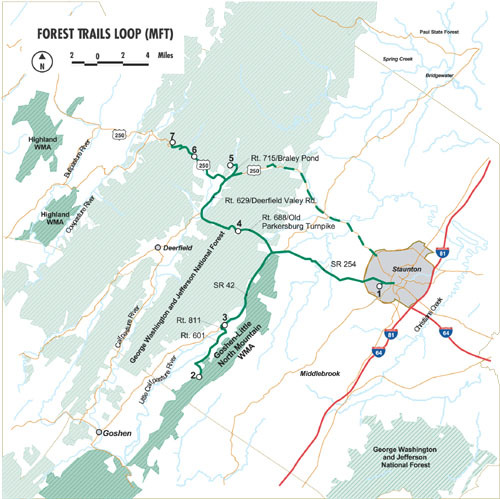 As the name implies, many of the sites on this loop are trails in the George Washington and Jefferson National Forest, situated along US 250 just west of Staunton. Historic Staunton is a rich cultural and historical town, with summertime jazz concerts and outdoor activities always on the calendar. A Shakespeare theatre, emulating an original Shakespeare Playhouse, attracts a great number of tourists as well. The loop begins with Montgomery Hall Park, a city park in the City of Staunton. Montgomery Hall Park has been a longtime favorite birding site of Yulee Larner, the well-known “bird lady” of Staunton. Countless visiting birders have enjoyed Mrs. Larner’s bird and nature walks in this park over the years. As visitors drive this loop, they will enjoy a quiet ride through largely agricultural fields towards other sites, making a slow climb uphill to the highest site on this loop, Shenandoah Mountain. Sites vary from several lower elevation wetland areas to spectacular awe-inspiring vistas from atop Shenandoah Mountain. The loop returns to the interstate coming back through the City of Staunton, providing travelers with an opportunity to more fully explore the city at the end of a day of wildlife watching.